1. In a large skillet, cook beef and onion over medium heat until meat is no longer pink. Add garlic; cook 1 minute longer. Drain. Stir in the salsa, beans, enchilada sauce, chilies, taco seasoning and pepper; heat through. 2. Spread 1 cup meat mixture in a greased 13-in. x 9-in. baking dish. 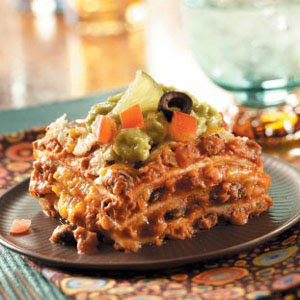 Layer with two tortillas, a third of the remaining meat mixture and 1 cup cheese. Repeat layers. Top with remaining tortillas and meat mixture. 3. Cover and bake at 375° for 30 minutes. Uncover; sprinkle with remaining cheese and top with tortilla chips. 4. Bake 10-15 minutes longer or until cheese is melted. Let stand for 10 minutes before serving. Garnish with olives, guacamole, tomatoes and sour cream if desired. Yield: 12 servings.